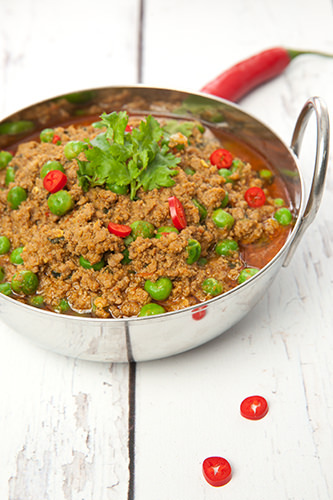 Keema Matar means minced meat and peas. It may sound pretty ordinary but this dish is so much more. It’s absolutely delicious! The mince comes alive with the Indian spices. Best of all it takes less than 30 minutes to prepare. I have chosen to make a spiced lamb mince because the spices taste so much better with the flavour and fat of lamb. 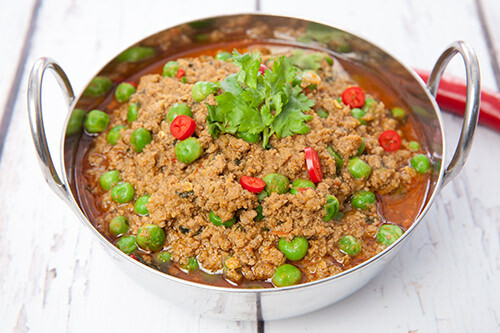 Keema matar is a dryer style curry which originated in North Indian. I like to serve the dish with homemade chapati bread. 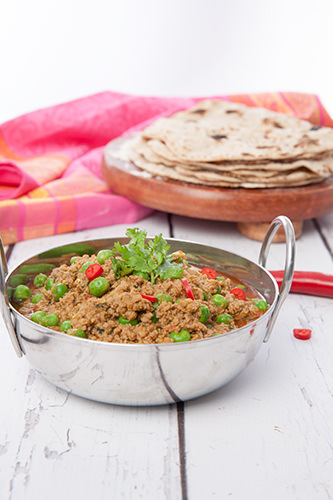 Just by adding big scoops of keema to a chapati you have a yummy, finger food style meal. Both of these recipes are featured in my new cookbook, An Indian ThermoKitchen. If you want to keep the meal simple, just serve the dish with basmati rice. I rarely have leftovers, but if you do you could use the mince to make Keema Samosa. Samosa with the spiced lamb mince is a whole other world of deliciousness! 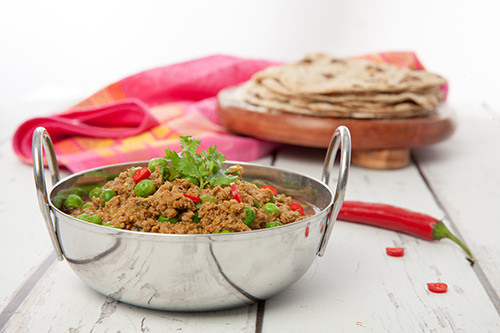 There’s a recipe for vegetarian samosa in the book, but you could use this keema recipe for a meat samosa filling. As with all Indian cooking, the most important consideration is the ingredients. Selecting authentic spices will give the perfect flavour to a dish. It has taken me a lot of years to realise that chilli powder in the supermarket is not Indian Chilli powder. The taste, heat and colour of Indian Chilli powder is completely different. To find the correct spices I like to go to an Indian store. In larger cities most Asian or gourmet grocer have a good range of spices. Other than spice selection the recipe is very straight forward and takes about as long to make as frying mince. I’ve included the Thermomix and stove top recipe method. In both recipes I’ve suggested using Niter Kibbeh as the oil of choice. This is not critical, I like the extra depth of flavour the Niter Kibbeh gives the Keema. If you don’t have Niter Kibbeh ordinary cooking can be substituted. 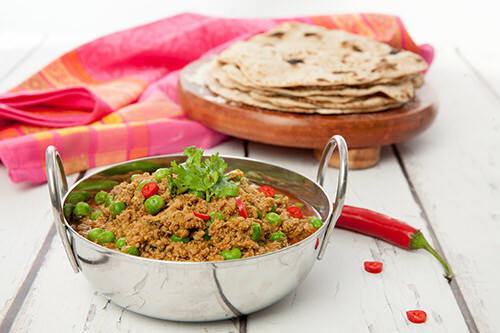 This an exclusive recipe from "An Indian ThermoKitchen"
The full instructions are available when you purchase the book. If you want to make this dish for dinner tonight rest assured the digital version will be available within 5 minutes of purchase and the hard copy of the book will follow in the post. If you’re thinking of making this dish make sure you pin it for later. Don’t forget to take a look at all the other great recipes included in An Indian ThermoKitchen.